Nice day in the markets, making new highs on both SPX and Nasdaq. All is right in the world…..or is it? For this discussion, I’ll define “real selling” as deliberate and rational selling done by large institutions. And at the same time lets define “panic selling” as retail investors** who are easily spooked and allow their emotions to get the best of them. Last week’s sell-off seemed almost entirely “panic selling” and that is evident by how quickly the market recovered. But while short lived, this quick drop did a good job of humiliating nervous holders and almost all of them are kicking themselves this week for their momentary weakness of “panic selling”. And on the other side, indecisive retail holders that didn’t sell were rewarded for sitting still. But more important for our analysis is both of these groups had the idea reinforced that it is smarter to hold than it is to sell. And this learned lesson will make it less likely we’ll have these same weak holders running for the exits next time. What this really means for the next sell-off is there will be fewer “panicked sellers” and a greater proportion of the sell-off will be driven by “real selling”. This is because the nervous traders “learned their lesson” last time and will not allow themselves to be part of the “panic selling” crowd this time. Now this doesn’t mean the next drop will be the real thing, but it will have a higher probability of being the real thing simply because more of the selling will be “real selling”. When a large number of the previously “panicked sellers” are patiently sitting on their hands, then more of the actual selling we see in the market will by default have to be “real selling”. Now I’m going to start making up numbers purely for illustrative purposes so don’t quote me on this, but lets assume last week’s sell-off was 25% “real” and 75% “panic”. Since there was no legitimate basis for the vast majority of selling, we rebounded in a matter of days. But the next time we sell off, there will be fewer “panic sellers” because these people learned their lesson about selling into weakness on the first pullback. So in this regard, the next sell-off will have a higher proportion of “real selling”. So maybe it will be 50% real and 50% panic. Because there is more “real selling” in this next sell-off, that dip will be a bit larger in size and duration than the one we just experienced. But the buy-the-dip crowd will rush in and support the market because buying the dips has paid off really well recently. You might even have some of the former “nervous sellers” buying the dip because they learned their lesson last time and want to profit this time. And form this boundless optimism we find support and recover. The steeper decline due to more “real selling” means we have further to go to make new highs, but now that we are 2-for-2 on bounces, almost no one is afraid of another slide because they “always” bounce. And with this complacent attitude spreading, the next time stocks start to slide we will see very little “panic selling”. But without any material “panic selling” this time around, that means virtually all of the selling causing the dip is “real selling”!!! Using my made up guesstimate, maybe 25% “panic selling” and 75% “real selling”. And when most of the selling is “real selling”, it is finally the time to be nervous! 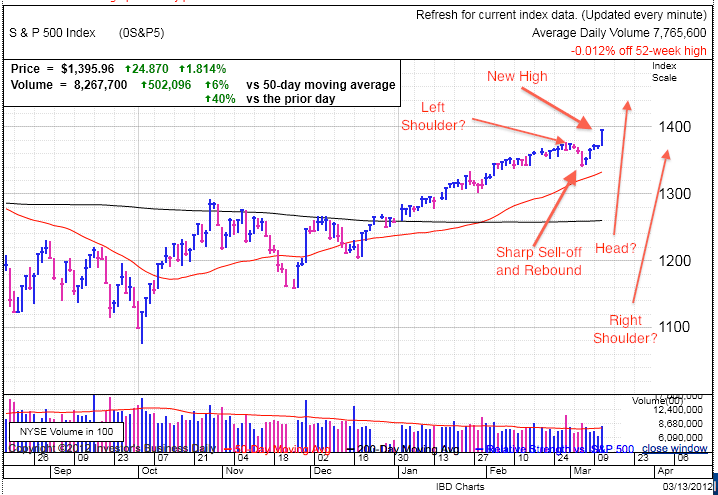 For those following along with a mental picture, they already know I just described the classic head-and-shoulders top. Is this where we are headed? I have no idea, but so far we are following the exact game plan necessary to form a head and shoulders, so it remains a real possibility and is something we need to be aware of. One important note, this will be a smallish H&S, so the resulting correction will also be smallish. This is because the only people who will actually see this price action are the obsessive types who follow the market daily. And since this is a smaller portion of the people who are invested in the market, the downward swing also won’t be very large. For a larger correction, we need to move beyond the daily-watchers and have sensational headlines drag in people who normally ignore their portfolio. For example fear of European Financial Contagion did that last summer and we had people moving their entire 401k to cash. As I stated in previous comments, this H&S is simply the way we are going to kick off the trading range we need to enter in order to digest these large gains since the start of the year. Remember two steps forward, one back. **For this argument I made retail investors out to be the stereotypical patsy, but the truth is professional investors are no more savvy and were also selling by the bucket load last week. Anyone who puts professional money managers up on a pedestal will have a hard time explaining why the majority of them always manage to under perform the indexes.